The dholak is one of the most widely utilized drums in the folk music of India. It has also found a permanent home in most of the recording and broadcast environments. Applications range from dance music such as bhangra and garba to devotional bhajans and keertans. The dholak is basically a double headed drum with the bass head on one side and the treble head on the other. The left hand is also a single membrane with a special application on the inner surface. This application is a mixture of tar, clay and sand (dholak masala) which lowers the pitch and provides a well defined tone. On the treble drum side, there is no putty added. The nut and bolt version of the dholak is a more modern and better engineered version of the Dholak. Some even call this version a dholki. 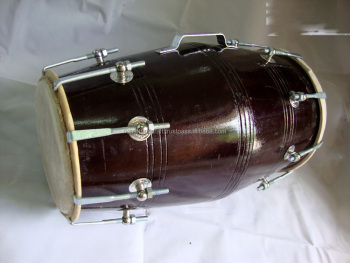 Dholak Wood : 16 Inches To 18 Inches. Bass Side: 8 Inches To 9 Inches. Treble Side: 6 Inches To 7 Inches.